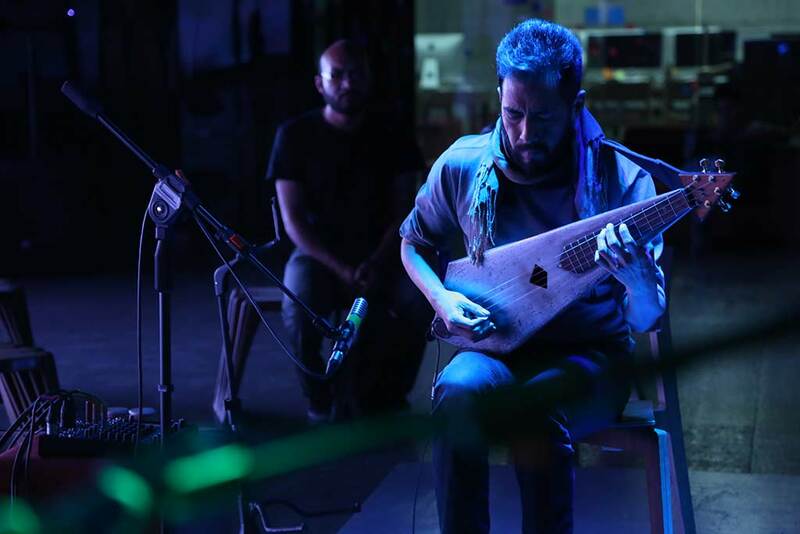 Multi-instrumental musician of self-taught vocational training and promoter of the Chapman Stick, Sotelo has become the main interpreter of the Stick in Mexico. He has taken courses and seminars in Canada, Spain and Mexico. At the same time, and beyond his work in CDC, he has an individual project based on the sonorous qualities of hand-made instruments like the Chapman Stick, the Bicéfono, and the Prism Jarana, applying different execution techniques and finding in the live-looping usage the electronic prosecution of ideal tools to expand the way of imagining and recreating music. From this creative exercise it was edited in 2018 the material Envés (Underside), available in all digital platforms. Sotelo has performed as a soloist in the Sri Lanka International Performing Arts in 2013, in the 14th International Book Festival in the Mexico City Zócalo, in Y2k14 International Live Looping Festival in Santa Cruz, California; in the 3rd International Encounter of Sonorous Art and in the Audiovisual Exploration, UNAM, 2016; in the Digital Culture Center; México Y2K17 International Live Looping Festival 2017; in the National Arts Center, 2018; and in Universum museum in 2018. He has taught in workshops and seminars in México and abroad: Master Class in The Vancouver Chapman Stick Seminar 2017; workshops and lectures in the Encounters of Tradition and New Songs, Culture Ministry 2016-1017; workshop with music students from Canyons College, in Santa Clarita, California, 2015; Stick seminar in the Free Music University in Guadalajara, México, 2015; Wings and Roots Program in secondary schools in Tláhuac, 2015; guitar workshop in Faro Indios Verdes, since 2010; Youth Workshops in the Cultural Center of the SHCP, 2014-2015; Juvenile workshops in the Swelanka Foundation, Colombo, Sri-Lanka, 2013; guitar workshop in San Lorenzo Tezonco campus, UACM, 2005-2008. *Beneficiary of the Young Creative Program of the National Found For Culture and Arts, México 2012-2013, and of the Program for the Promotion of Cultural Projects and Co-Investments of the National Found For Culture and Arts, México 2003-2004.